Twenty-four years ago, on a cold and foggy night, on November 9, 1989, the Berlin Wall came down. It was 7:30 p.m. that day when Günter Schabowski, an operative of the Communist Party told two dozen reporters live on camera that citizens of the GDR would be permitted to leave the country. Right away, hundreds and soon thousands of people went to the checkpoints and demanded to cross the border, louder and louder. Finally, at 10:30 p.m., a nervous guard at the Bornholmer Bridge checkpoint made the call: he opened the gates, and droves of happy people, along with a lot of honking cars, poured into West Berlin. Berliners from the West and the East hugged each other. During the next hour, all checkpoints opened. Berlin celebrated one long, happy night. If you are wondering what's left of the Wall, read The Berlin Wall Today, by Michael Cramer, an Green Party representative and bicycle activist. The book, which features more than one hundred color and black-and-white pictures, showcases Wall memorials and remnants in back yards, along train tracks, at churches, and in cemeteries. It takes you to Mauer Park, where people from all over world meet for Karaoke and parties; a guard tower that became the Museum of Forbidden Art; the Topography of Terror Museum, with the former Gestapo headquarters, the Reichstag, the East Side Gallery, and Checkpoint Charlie. 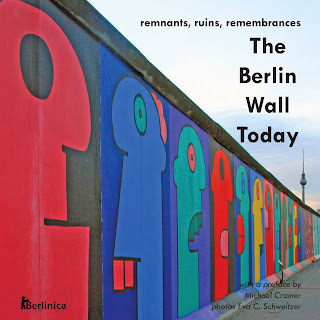 The Berlin Wall Today is also available as an enhanced e-book with maps and hyperlinks to websites of the memorials, former border crossings, and the other important sites along the Wall, including a 3D simulation of where the Wall once stood. To celebrate the anniversary, Berlinica participates in Amazon's Matchbook program; if you buy the printed book, you will get the enhanced ebook for less than half-price—for $2.99 only. Click on the picture, it will take you to the Amazon page.